Pediatric dental emergencies can be terrifying. It does not matter whether the pediatric dental emergency is minor or major. While one of the main reason for a pediatric dental emergency is that a child collides into something that causes one or more of their teeth to break or even fall out, there are many types of pediatric dental emergencies that can occur. Thus, it is necessary for parents to always prepare for the worst possible outcome. According to the American Academy of Pediatric Dentistry, it is an essential duty for every dentist to provide emergency care for infants, children, adolescents and individuals with special health care needs. Pediatric dentistry is a branch of dentistry that focuses on children and teens since both age groups may need specialized dental care. A pediatric dentist is also known as a kid-friendly dentist with special training to deal with children’s dental needs along with special training to deal with children on a social level. This means a pediatric dentist knows how to communicate with children in order to get their trust, ensuring that they will return for future treatments. As a pediatric dentist, we also create a comfortable environment to help children relax during treatment. By creating a positive experience, we can help children maintain a more positive image of regular dental checkups in their mind. Since not all pediatric dentists provide emergency dental services, finding an emergency pediatric dentist to contact before an emergency situation occurs is beneficial. An emergency pediatric dentist has the necessary training to handle pediatric dental emergencies. Thus, visiting one is going to ensure that the child receives as effective emergency dental care services as possible. An emergency pediatric dentist is always available for their patients and can, therefore, answer any emergency-related questions a parent may have about their child. Toothaches in children are a fairly common complaint and can occur in children of all ages. A toothache is considered to be a pediatric dental emergency if the pain continually increases or persists for more than 24 hours. Even if the broken tooth seems to be minor, it needs to be evaluated by an emergency pediatric dentist because it is now weak and can easily further break, leading to additional dental issues. When a child has a tooth completely knocked out of their mouth, an emergency pediatric dentist is necessary. They will do their best to save an adult tooth but may or may not try to save a baby tooth. If the wound is large or will not stop bleeding an emergency pediatric dentist may be necessary for repair. Use a soft cloth to cover the area and apply gentle pressure where there is pain. Pick up the knocked out tooth by the crown, gently rinse and place in a glass of milk. You can use over the counter medications, if necessary. Rinse the child’s mouth with warm water and cover with a soft, cold compress to help reduce any swelling. Over the counter medications can be used if necessary. Place a cold compress firmly against the area to help control any bleeding. Over the counter medications can be used if necessary. 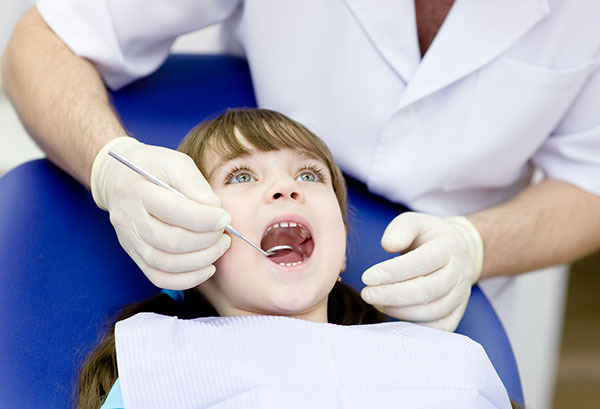 Cavity treatment for kids is necessary when tooth decay is present. A kid friendly dentist will first remove any tooth decay and will then choose silver fillings or white fillings to repair the tooth. White fillings are often more preferable since they consist of a composite resin, which is going to match the color of the child’s teeth. Since white fillings are virtually unnoticeable the child will not feel self-conscious when smiling with white fillings. A children’s root canal is also known as pediatric root canals and baby root canals. The reason why a pediatric dentist will often choose to perform a root canal instead of extracting the tooth is that missing teeth can lead to additional oral health issues. A children’s root canal can save the tooth, which is more beneficial since a full set of teeth is supportive of a healthy mouth. If you have any questions or want to schedule an appointment, give us a call today. If you would like to learn more about Pediatric Dental Emergencies and the various treatments we provide, call 832-246-7255 to schedule a consultation.